Betfair review 2019 – Betfair are the leading player in the betting exchange industry but does the platform live up to all the hype and should you sign up for an account in 2019? Read this in-depth Betfair review to find out more. What’s in this Betfair review? So what are you going to find in this Betfair review? We’ve racked all the brain cells and gathered as much information in order to write this awesome Betfair review which we know you’re going to love. If you’re contemplating opening a new betting exchange account but you’re not sure which platform to use, this review is for you. We’ve listened to the community and included their thoughts in this review. But we’d also love to hear your assessment of Betfair in the comments section below. There’s probably no need to introduce Betfair to the majority. Whether you’re an experienced bettor or just getting started, you’ve undoubtedly heard of the Betfair exchange. They are one of the largest online betting companies and the biggest player in the betting exchange market. Founded back in 1999, Betfair revolutionised the betting industry with the innovative idea of creating a peer to peer betting platform – what we now know as a betting exchange. In 1999, Betfair launched with quite a bang as they ran a coffin through the streets of London with the slogan ‘Death to the Bookmaker’ emblazoned on the side. The media loved it and it was brilliant marketing from the team at Betfair. There was a huge buzz around the new concept of peer to peer betting. With the UEFA Euros in 2000 just around the corner, traditional bookmakers were not happy with the new craze. They were worried about match fixing and money laundering and claimed betting exchanges should be banned in the UK. In reality they were just worried about losing customers and being on the back foot. It’s fair to say, traditional bookmakers haven’t died like Betfair claimed they would. However, they’ve had to re-evaluate how they entice customers and stay competitive with modern betting exchanges. One of the main challenges bookmakers continue to face is the inherent benefits to players using a betting exchange. We’ll come onto these reasons later in our Betfair review. Before we get into the nuts and bolts of our Betfair review, let’s look at what a betting exchange is and why they’re so popular. Betting exchanges are a way of betting online without involving a traditional bookmaker. They allow bettors to place wagers against each other rather than against a bookie. The concept is similar to financial trading apart from your dealing in bets rather than stocks etc. Betfair and other betting exchanges simply provide the software and technology to facilitate peer to peer betting. The betting exchange don’t take on any bets so there is zero risk in their business model. They simply charge a commission on players’ net winnings. This model allows betting exchanges to offer the true market price meaning the punter gets more value. This is one of the key reasons Betfair and other betting exchanges have become so popular. Next up in our Betfair review, we’re going to look at the main ingredients that make for an awesome betting exchange. Through experience, I believe the following aspects are the most important when it comes to analysing a betting exchange in 2019. If you’re looking for something in particular feel free to jump to different sections of the review using the links below. First up in our Betfair review, we’re going to look at markets. Do Betfair offer a comprehensive range of markets covering the most popular sports and events? The more markets a betting exchange offer, the better. As you’d expect from the oldest, largest and most popular betting exchange, Betfair have a great range of markets available. Their markets span across many different sporting, topical and political events. They’ve got pretty much any market you could think of. If you’re ever in need of a rare market, Betfair is the place to go. That’s not all, Betfair also offer markets on Australian Rules, Gaelic Games, Mixed Martial Arts and Winter Sports, most of which you won’t find at other betting exchanges. Overall, when you compare the markets Betfair offer to other betting exchanges, they’re on a different level. Betfair certainly have the widest range of markets. Next up in our Betfair review, we’re going to look at odds. This is one of the most important criteria when analysing betting exchanges. Better odds are always going to entice more punters. As I mentioned earlier, betting exchanges can offer the true market price as they don’t have to build their profit margin into the odds. The odds are driven by gamblers. The more popular a market is, the better the odds are. As you’d expect from the most popular betting exchange, their odds are right up there and generally lead the way in the industry. In my experience using Betfair, their odds have always been great even when you look at rare markets. Something that isn’t the case at Smarkets and Betdaq. Next, we’re going to consider the Betfair commission rate and how it compares to other betting exchanges in the industry. As I mentioned earlier, betting exchanges make money by charging a commission on players’ net winnings. It’s only a small amount but as the saying goes ‘every little helps’. This is a crucial aspect for those of you looking to maximise your income from betting strategies like matched betting in 2019. The commission you pay has a direct impact on your profitability. Therefore the aim is obviously to pick an exchange that charge a low commission rate. Unfortunately Betfair don’t offer the most competitive rate. 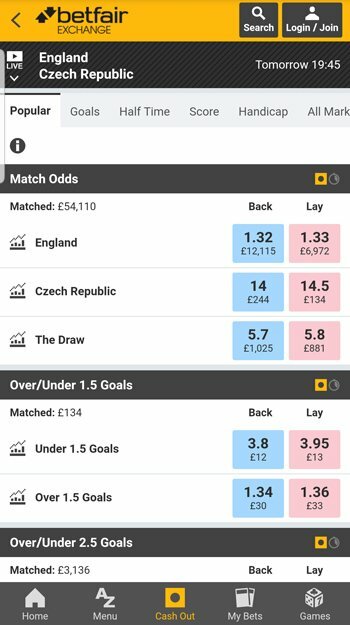 Betfair charge customers a 5% commission. This doesn’t sound like a lot, but when you compare it to the competition, it’s quite high. Here’s an example of how much you could save by using Smarkets (2% commission) over Betfair. As you can see, you would spend an extra £15 by using Betfair rather than Smarkets. In my view, that’s a high price to pay just to use Betfair. They obviously feel they have enough market share to keep their commission higher than the likes of Smarkets and Betdaq. However, this is one of the key drawbacks to the Betfair betting exchange. 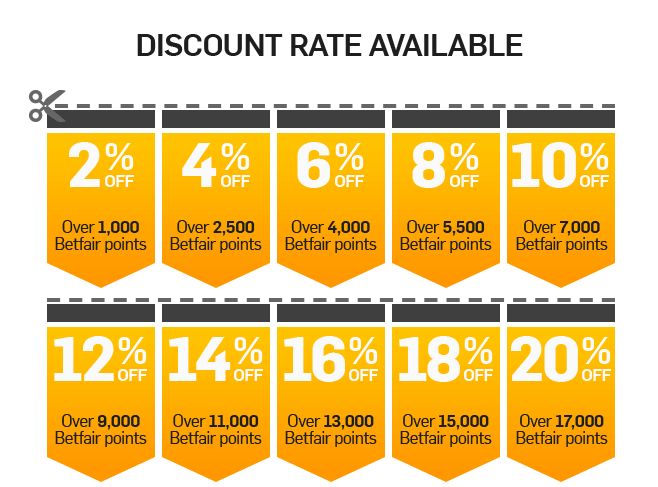 Betfair do offer a way to reduce your commission rate and it’s called Betfair Points. This is a loyalty scheme designed for existing customers. In simple terms, for every winning or losing bet you place at the Betfair Exchange you earn points. The more you bet, the more points you win. These points allow you to reduce the amount of commission you pay. In theory, a great idea from Betfair. However, in all the time I’ve been betting I’ve never really managed to reduce the commission rate by that much. The few points you do earn don’t really affect the overall commission you pay. A shame because it’s a great idea. I’d like to see more points offered per bet, or a reduction in points needed to qualify for lower commission rates. The next criteria we’re going to look at in our Betfair review is liquidity. This is a vital aspect of a great betting exchange so it needs careful consideration. This may be a new term to some of you, so here’s a little introduction. Liquidity is the amount of money waiting to be matched on a certain market. For a bet to be accepted by the betting exchange there needs to be another player looking to bet the opposite. The liquidity refers to the number of people in the queue to place a bet. It’s like a queue in a shop. The more people in the queue, the better (for the shop). So what’s the liquidity like at Betfair? In short, it’s very good! This is certainly one of Betfair’s strongest aspects due to the sheer size and popularity of the company. Liquidity works hand in hand with popularity, so Betfair are always going to do well in this regard. There are times when Smarkets and Betdaq may struggle with liquidity on less popular markets. This is not the case at Betfair and if they don’t have the required liquidity, no one will! The amount of money that has been matched, directly links to the liquidity of a market. It shows how popular the event is. Taking a closer look, it’s clear to see that Betfair beat the competition outright. The amount matched on their platform is considerably higher than the other betting exchanges. Next up in our review, we’re going to look at the technology Betfair use. In this category we’re looking for reliable technology that continuously meets the demands of its users. As I mentioned earlier, Betfair were the first betting company to create the exchange platform paving the way for peer to peer betting. Therefore they have the most experience in how to run an exchange and they know exactly what their users are after. There’s no doubting the amount of time and money Betfair spend on keeping their tech right at the forefront of the industry. Betfair proudly state they are part of the API Billionaires Club alongside the likes of Google, eBay and Twitter. This is a club that boasts to have more than a billion API’s each day. In plain English this means they are dealing with stupendous amounts of data – from bet transactions to continuously changing market prices. If they’re dealing with that much information you can be sure their technology must be very sophisticated and reliable. Customer support is another key consideration when it comes to a great betting exchange. In the modern world of online gambling bettors want immediate help to their problems and questions. Due to their age and size you’d expect Betfair to excel in this department. The company has had a long time to work out how to best solve their customers’ needs. Having said all that, it doesn’t take much digging online to see that not all customers are pleased with Betfair’s customer support. I understand you can always find bad reviews if you look hard enough, but I came across more than expected. Despite these bad reviews, this is not what I’ve experienced when contacting Betfair with issues etc. Furthermore, from listening to the community and our members, most are generally complimentary of the Betfair support network. Overall, I’ve had no issues with getting in touch with the required support over the years. I personally can’t fault the Betfair betting exchange in this regard. Next we’re going to look into the promotions Betfair offer both new and existing customers. In the bonus culture of modern gambling, bettors are always on the lookout for sign up offers and other free bets they can take advantage of. It’s therefore a key consideration when it comes to picking a new betting exchange. In actual fact, this may be the deciding factor for a lot of punters. Whilst the Betfair exchange don’t actually offer a sign up promotion for new customers, the Betfair Sportsbook does. As the Betfair exchange grew, the company decided to diversify. In 2012 they entered the sportsbook business. To some, this seemed a strange move after their initial ‘Death to the Bookmaker’ marketing campaign. Being a bookmaker, Betfair offer a sign up promotion to customers. At the time of writing they offer £20 in free bets to new customers. In terms of ongoing promotions, the exchange don’t typically offer many. However, the sportsbook do. Payments play a key role in modern online gambling. Long gone are the days of placing bets over the counter in cash. Typically betting companies will have a minimum deposit amount that you need to consider. Betfair have a minimum deposit amount of £10 for each of the above payment methods, except Neteller which is £12. The same methods can be used for withdrawing funds from your account. However, you must withdraw your funds with the same method you deposited them with. This has caught a few people out in the past so keep this in mind. There is no minimum withdrawal amount for card payments, it’s £1 for PayPal, £2 for Neteller and £10 for bank transfers. When it comes to online payment methods, you need to keep an eye on any fees, the bookmaker or provider may charge. Betfair detail any fees and charges within each users account. Next up in our Betfair betting exchange review, we’re going to look at reliability. This is a key ingredient to a great betting exchange and one that most bettors are well aware of. This is one of the most important aspects for any matched bettors out there. The last thing you need is for the exchange website to crash, leaving you unable to place the required lay bets. Betfair are one of the most reliable betting companies out there. It’s not surprising when they’ve had nearly 20 years of experience building and improving their betting platform. In my experience I’ve never had a problem with reliability, even during high volume betting events like the Grand National and the Football World Cup. This is certainly one of the stand out aspects of the Betfair Exchange. Last on our list, we’re going to look at the live streaming service Betfair offer. Whilst this isn’t a vital part of a betting exchange, it’s these extra features that make the difference. Betfair are one of the few betting companies that have a live streaming service available for their customers. This is an awesome feature that makes the whole betting experience more exciting. Live streaming is especially awesome for events which are not shown on live TV such as horse racing for example. By watching the live stream, you know exactly which bets have won and where your profit has ended up. There is one catch to watching live streams on the Betfair betting exchange. You need to stake a bet of at least £5 to qualify. Whilst this is very little, it’s rather annoying if you ask me. Overall, a nice feature that few betting companies can boast. What’s it like using Betfair? In this next section of the Betfair review, we’re going to look at what it’s like using Betfair on a regular basis. To kick things off, let’s look at how you place bets at Betfair. Placing bets at Betfair is very simple. Follow the strategy below if you’re unsure. Note: Betfair use a different colour scheme to other betting exchanges. Blue refers to back bets whilst pink refers to lay bets. Select the event and market you want to bet on. If you’re happy with the odds click on the correct price. Enter your stake and check the liability if you’re placing a lay bet. This is the amount you stand to lose should your lay bet not come off. You need to ensure you have enough money to cover this scenario. Another important aspect of using a betting exchange on a regular basis is the user experience of the website and mobile application. What’s the Betfair website like? Betfair have opted for a more functional site compared to other betting exchanges. They have a lot more links to different events and markets than say Smarkets. Arguably their site is too cluttered making it slightly more difficult to use. However, quick links to certain popular events and markets speeds up your betting and may allow you to make more profit. All in all, I prefer using a more aesthetically pleasing site like Smarkets but I guess that’s subjective and everyone will have their own opinion. Mobile sites and applications play a huge role in the modern world of gambling. Most punters will almost certainly place bets on these platforms. It’s therefore crucial these platforms are up to scratch. As you’d expect from one of the largest betting companies, Betfair have a great mobile site and application. Both platforms are very easy to use and make placing your bets on the move a doddle. In a straight fight between Smarkets and Betfair, I’d go with the Smarkets app. It looks better on the eye and I think it’s easier to use. Again, this is very subjective so feel free to disagree with me on this one. For those of you that use matched betting to profit from bookmakers promotions and free bets, a betting exchange is an essential tool. So what’s matched betting with Betfair like? Overall, you should certainly open an account for Betfair matched betting in 2019. Betfair Review 2019 – Should you use them? Betfair are certainly a great betting exchange and undoubtedly the most popular in the industry. So should you open an account with them in 2019? It really depends on what you want to get out of your betting. If you’re looking for an incredibly reliable, efficient service with an abundance of markets available you should certainly open an account with Betfair in 2019. You will very rarely have a problem with high volume events and they offer an awesome live streaming service which most betting companies don’t yet offer. On the other hand, if you’re looking for a betting exchange which charge a low commission rate, Betfair is not for you. There are better alternatives out there such as Smarkets or Betdaq. Overall, using a mixture of betting exchanges including Smarkets, Betdaq and Matchbook is likely to give you the best results. Are you going to be opening an account with Betfair in 2019? Let me know by leaving a comment below right now.